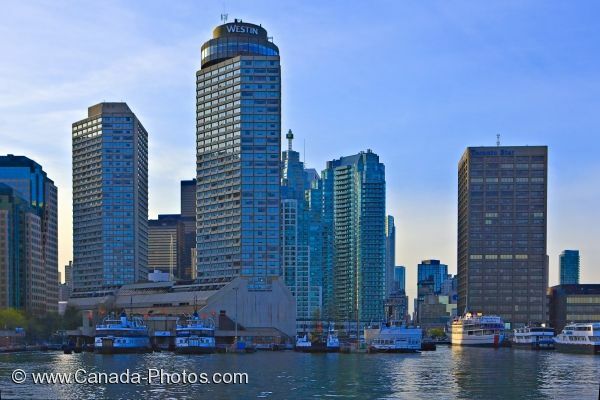 Along the waterfront at the foot of Bay Street and Queens Quay in the City of Toronto, Ontario in Canada, sits the ferry terminal. Coming in on the Toronto Islands ferry, one can enjoy the skyline scenery of the city as the sunlight reflects off the skyscrapers and the surface of the water. The Toronto Island Ferry travels from the main terminal in the downtown core of the city and goes between Hanlan's Point, Centre Island and Wards Island. There are three separate ferries going to these islands and the schedule for each individual island is different, so one should check them all before traveling to these islands. Picture of the ferry terminal and the skyscrapers which make up the skyline of the City of Toronto in Ontario, Canada. ... Returning from any one of these islands allows visitors to see the skyline of Toronto making one realize what a massive and fast paced city it is. Ferry terminal Toronto. Skyline of Toronto seen from the Toronto Islands Ferry, City of Toronto, Ontario, Canada.